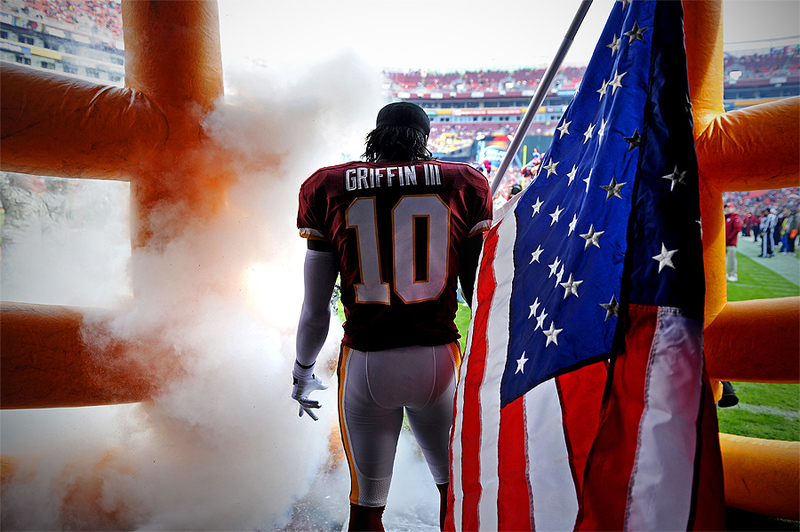 "Quarterback Robert Griffin III #10 of the Washington Redskins holds an American flag for "Salute to Service" day before being introduced against the Philadelphia Eagles at FedEx Field on November 18, 2012 in Landover, Maryland." Shooting at the same venue can get repetitive, but never mundane. We as photographers learn the inner workings of each stadium - we know where the light will be, when the players take the field and who will shine as they attempt to lead their team to victory. Yet the beautiful part is that nothing is ever the same. Every game is different - weather changes, rules tighten or loosen, players get hurt, traded, and so forth. With that said, I've worked the tunnel at FedEx Field way too much. I've shot the player introductions time and time again. 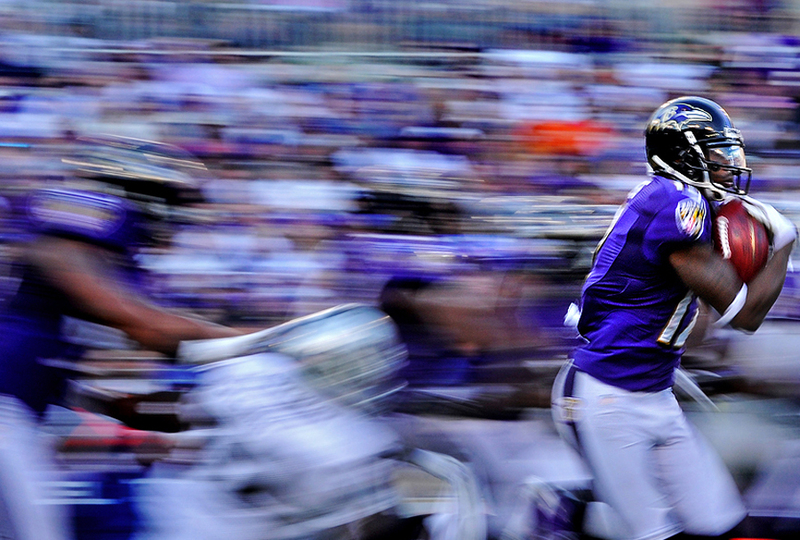 I've nailed touchdowns, and I've missed my share, too. So I going into the game, shooting for Getty Images, I was hoping for document this game a bit differently. While I wanted to focus strictly on the action going into the game, I still couldn't contain my curiosity for pregame features. I found myself blending in during team introductions as quarterback Robert Griffin III of the Washington Redskins unraveled a flag inside the inflatable tunnel as part of the NFL's "Salute to Service" day. "Zach Gascho #1005 of Catoctin looks down at his teammate Garrett Buckley #1002, after he and other runners collapsed to the ground as they finished the Boys' Class 2A Maryland MPSSAA Cross Country State Championships at Hereford High School on November 10, 2012 in Parkton, Md. Buckley finished the race in 33rd place, while their team went on to finish in 26th overall." Sometimes we shoot assignments and it doesn't feel like anything connected. But a second look at the take leads to an edit. This is what happened when I covered the the Maryland MPSSAA Cross Country State Championships at Hereford High School. More than 1,000 runners from all over the state of Maryland competed in the race that many call the "The Toughest Three Miles in Cross-Country." The course, "Bull Run" is a tormenting race for its participants. Runners start the course shoulder-to-shoulder, stretching out midway, only to find themselves at the finish line, laying side-by-side with teammates and their competition, gasping for oxygen after giving the course all their heart. On paper, it sounds like an amazing assignment. Yet when shooting in person, nothing seemed to be lining up. Following the races, I moved my selects of the local teams, overall story to my client and shut down the computer. When I came back to the take the next day, I found that I indeed captured the course as the hellish nightmare runners endure. 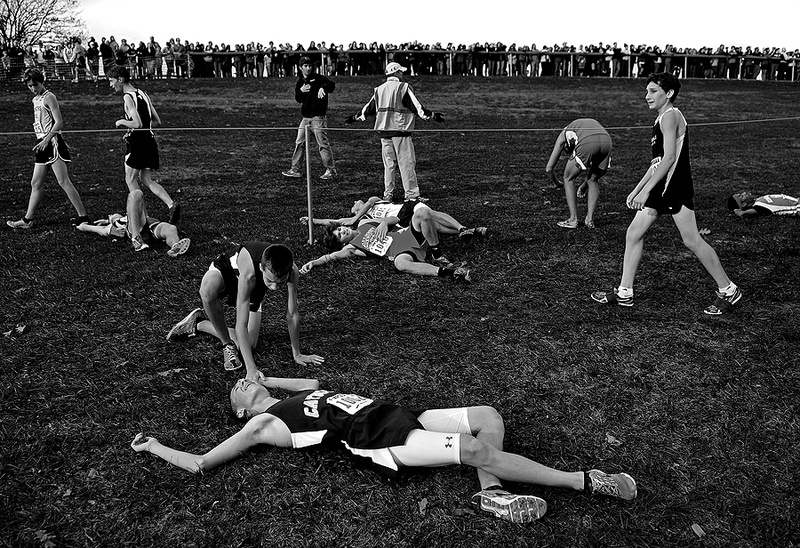 Purely draining the athletes, physically and mentally, these images depict the nightmare at Bull Run. 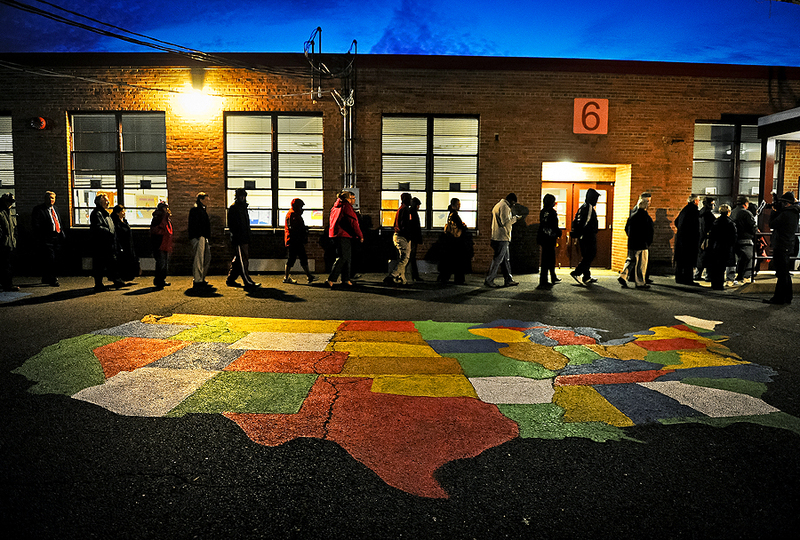 "People enter Washington Mill Elementary School to cast their vote in the U.S. presidential race, on November 6, 2012, in Alexandria, Virginia. Recent polls show that U.S. President Barack Obama and Republican presidential candidate Mitt Romney are in a tight race." I never used to be a morning person. I used to dread early mornings, but over the years I've learned to enjoy the peacefulness of the morning. However, sometimes getting up at 3 a.m. to cover the presidential election wasn't very calming. Worried about possible traffic, and what I'd find during the day, for some reason had my nerves on high alert. During my drive to Alexandria, Va., to begin voting coverage for Getty Images, I did what I never do - I tried to think of what I might see during the day. Doing this typically leads to disappointment. At the first school, I arrived to freezing cold temperatures, darkness and people are wrapped around the block to vote. Things weren't looking good in my mind. I worked the line trying to capture something fresh and a frame that said this election was a big deal in the swing state of Virginia. But it wasn't until the gate opened and I saw the painted U.S. map in the courtyard. This image told the story of voters lining up before sunrise and waiting in long lines to elect the next President - all while having a graphic to boot. Although my coverage the rest of the day was a good file, the early morning call gave me my favorite, graphic and story telling image of the day - even if it was people simply standing in a line. This image would have not been as visually strong once the sun came up and I credit the early morning wake up call to it. 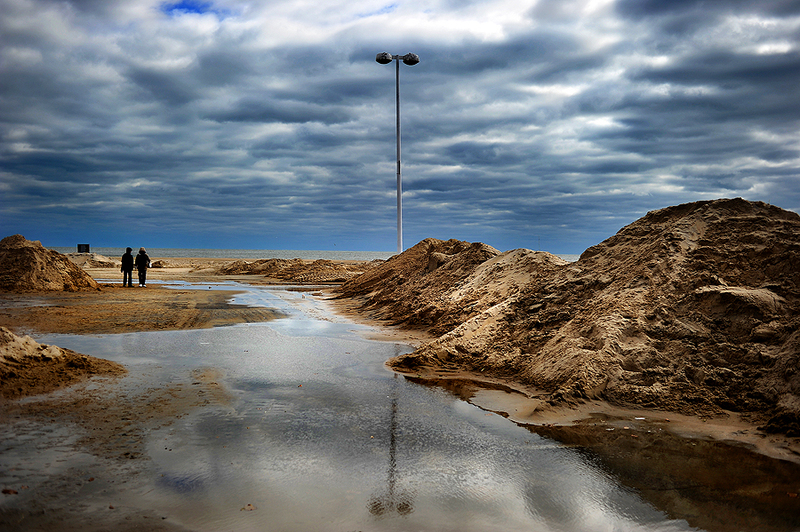 "Two passerby survey the damage in the inlet parking, as it remains flooded and stacked with piles of sand after Hurricane Sandy hit days prior on November 3, 2012 in Ocean City, Maryland." If I've learned anything, it's that weather disturbances never make scheduling easy. Weeks before I took on an assignment to go to Penn State to cover their game against Ohio State. But when Hurricane Sandy began brewing out in the ocean things started to become complicated. While I stayed on my original schedule, for a brief moment I had multiple clients wanting me to head to Ocean City, Md., where it looked like the storm may make it's first landfall. In the end, more than 50 people were killed. It wasn't until days later that I made it down to Ocean City, Md., to survey the damage. Although nowhere near the damage like that north of Baltimore, the disruption and damage was bad in its own right. Having been to Ocean City since a kid, I never saw the inlet parking lot anything like I saw. In addition to coverage, I also shot some Instagrams of what I saw over on my iPhone blog. With that, please remember to donate to the American Red Cross for Hurricane Sandy Relief to help those in need. "Quarterback Braxton Miller #5 of the Ohio State Buckeyes dives into the end zone for touchdown against the Penn State Nittany Lions in the third quarter at Beaver Stadium on October 27, 2012 in State College, Pennsylvania. The Ohio State Buckeyes won, 35-23, to remain undefeated." Last weekend, I ventured north back to my home-away-from-home to shoot the Ohio State Buckeyes take on the Penn State Nittany Lions for Getty Images in State College, Pa.
Ironically, of all the time I've spent in Penn State over the last year, I haven't shot one football game. Maybe I should be more clear, I have never shot any action on the field. At past games, I've shot features and news rather than the plays on the field. As much as I wanted to continue to document the ongoing scandal, story - I stuck to the game plan and focused on the action of the game - which I might add is no easy task at that stadium as the sidelines very, very overcrowded. Much like every other game I've been at - Penn State lost - and this was my favorite story telling frame of the game.